3 Algebra takes over! 48z = 96 z = 2 –9y – 15(2) = –39 –9y – 30 = –39 –9y = –9 y = 1 x + 3(1) + 8(2) = 22 x + 3 + 16 = 22 x + 19 = 22 x = 3 (x, y, z)  (3, 1, 2) If you are adept enough, you can try the first 2 steps at the same time to speed up the process. 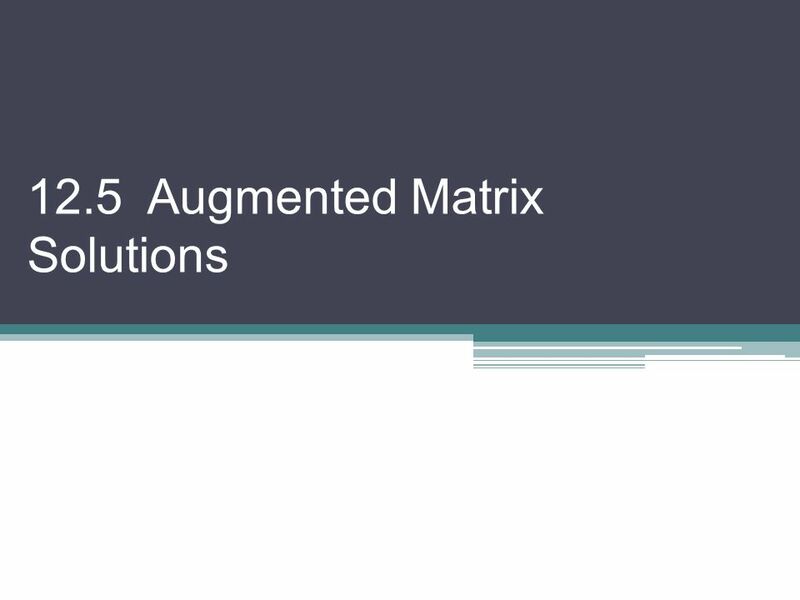 Download ppt "12.5 Augmented Matrix Solutions. 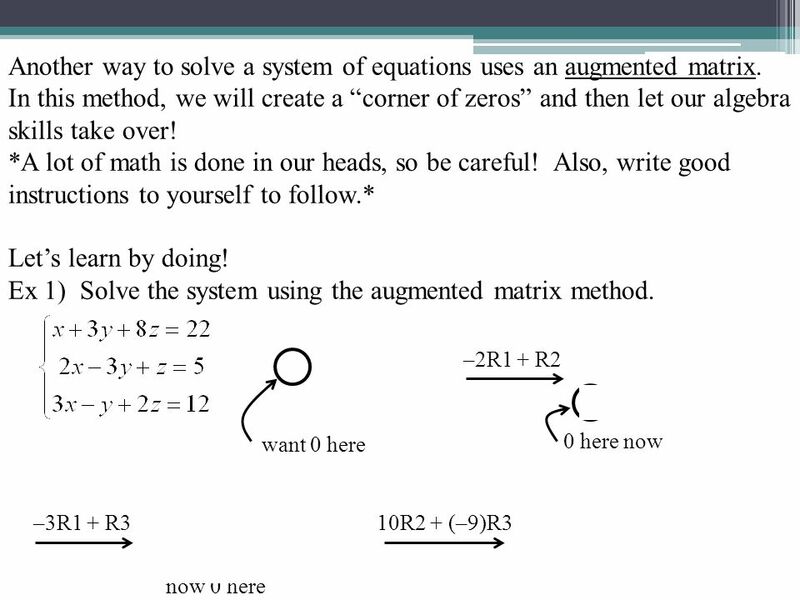 Another way to solve a system of equations uses an augmented matrix. In this method, we will create a “corner of zeros”"
Graphs and Equations of Circles Book: Math 3 (Green Book) Section: 5.2. 11.1 Intro to Conic Sections & The Circle. What is a “Conic Section”? A curve formed by the intersection of a plane and a double right circular cone. 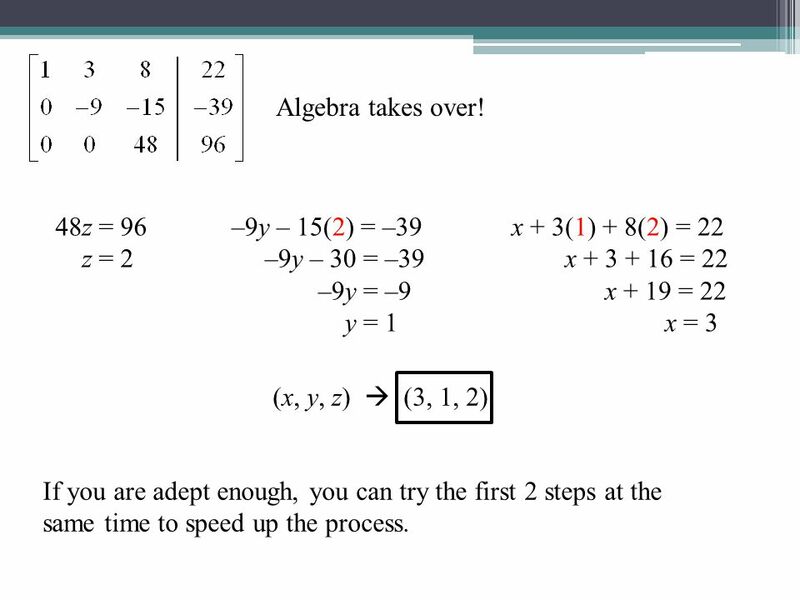 TODAY IN ALGEBRA…  Warm Up: Review Distribution and Combine like terms  Learning Goal: 3.2 You will solve 2- step equations using Algebra  Independent. 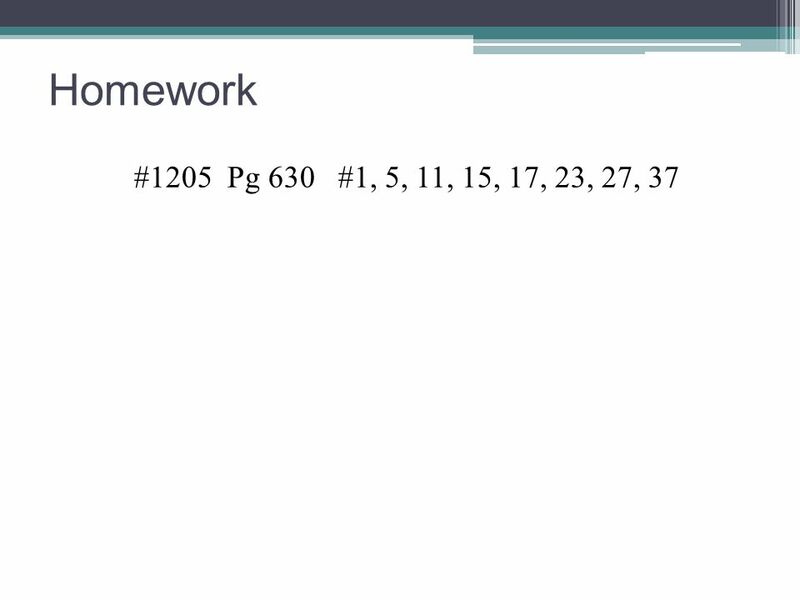 TODAY IN ALGEBRA…  Warm up: Find products of special polynomials  Learning Target: 9.4 You will solve polynomial equations in factored form  Independent. Section 8.3 – Systems of Linear Equations - Determinants Using Determinants to Solve Systems of Equations A determinant is a value that is obtained from. Bell Problem Find the real number solutions of the equation: 18x 3 = 50x. Solving Quadratic/Linear Systems Algebraically Integrated A2/trig. 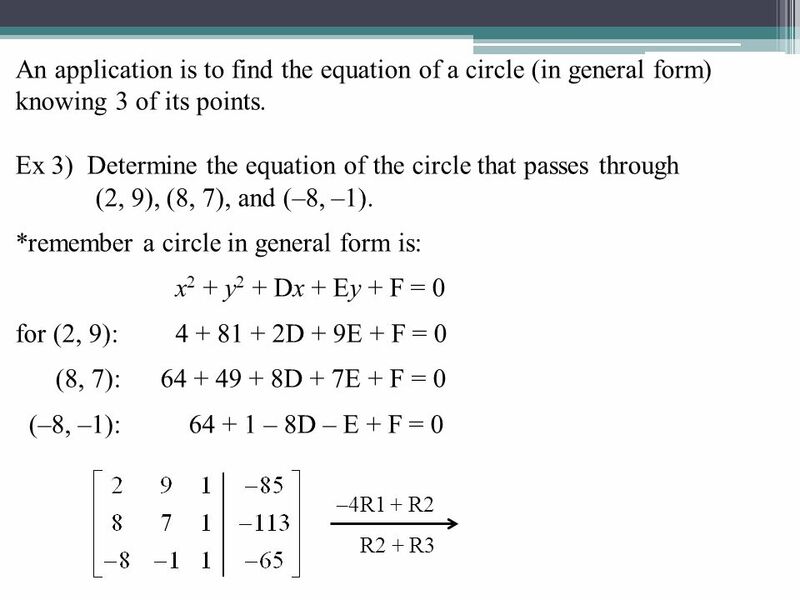 1.1.2 INTRODUCTION TO SYSTEMS OF LINEAR EQUATIONS Chapter 1: Systems of Linear Equations and Matrices SWBAT: Redefine algebraic operations as Elementary. Welcome back…. Let’s warm up! 1) 4x + 5y = 12 2) 3x – 2y = 12 4x + 3y = 4 4x + 2y = 2. 6.3A – Logarithms and Logarithmic Functions Objective: TSW evaluate logarithmic expressions. 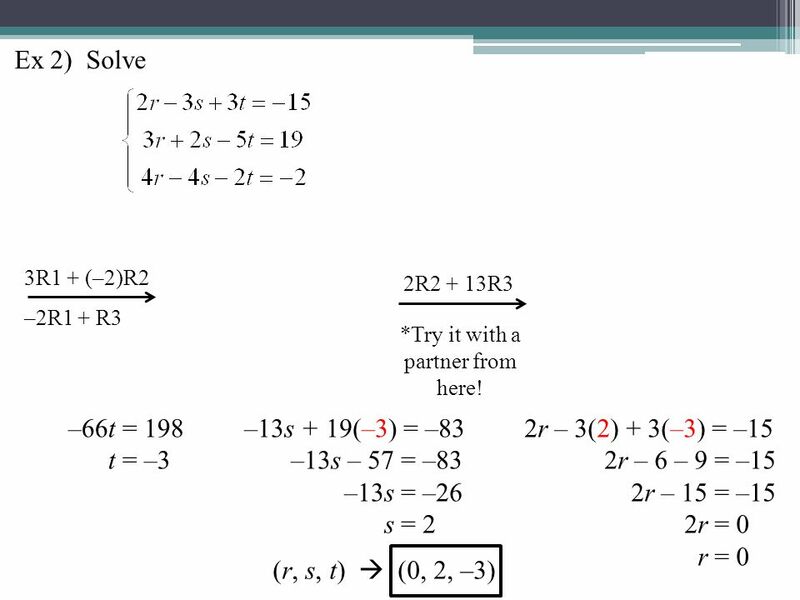 3.5 – Solving Systems of Equations in Three Variables. 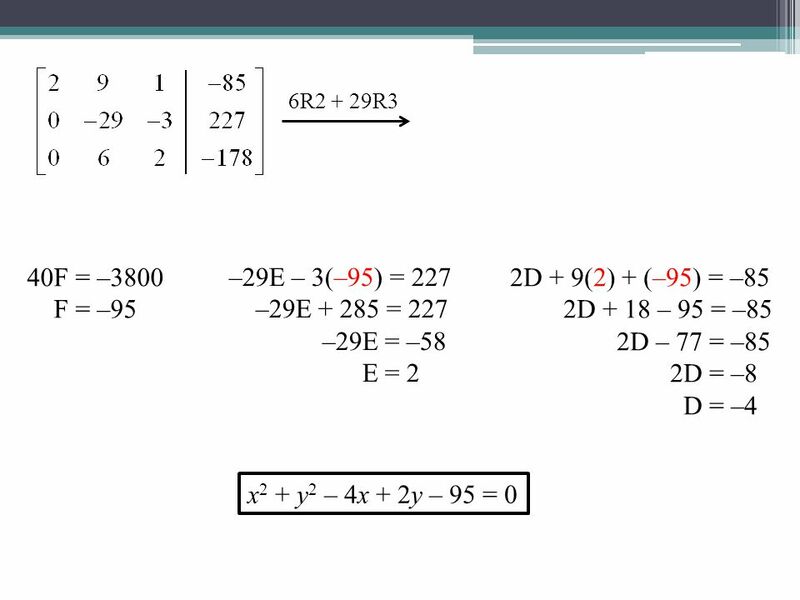 Two Step Equations with Decimals SWBAT solve two step algebraic equations containing decimals by applying the appropriate properties of equality.